Donald Trump, the national front-runner, keeps his big lead in two of the three early states of New Hampshire and South Carolina, but now Texas Sen. Ted Cruz has moved past Trump into a lead of his own in Iowa. Florida Sen. Marco Rubio remains in double digits in New Hampshire and South Carolina, and Governor Chris Christie has now shown upward movement in New Hampshire, doubling his support there in the last month. The backdrop to all this is a mood of anxiety - both economic and personal security - pervading the GOP electorate in these early states. Nine in ten in all states feel the country is now a more dangerous and insecure place, including 95 percent of Iowa GOP voters who say that, and nine in ten feel the nation's economic system is one that hurts them instead of benefits them. Terrorism and national security are now specifically front-and-center on primary voters' minds: in Iowa, 61 percent say it is their top decision-making criteria for candidates, ahead of the economy; in New Hampshire, 66 percent cite terrorism and security ahead of 28 percent on the economy. Ted Cruz, building on momentum he first showed in our polling last month, has overtaken Trump in Iowa with a big boost from evangelical voters and specifically, from the former backers of Ben Carson. 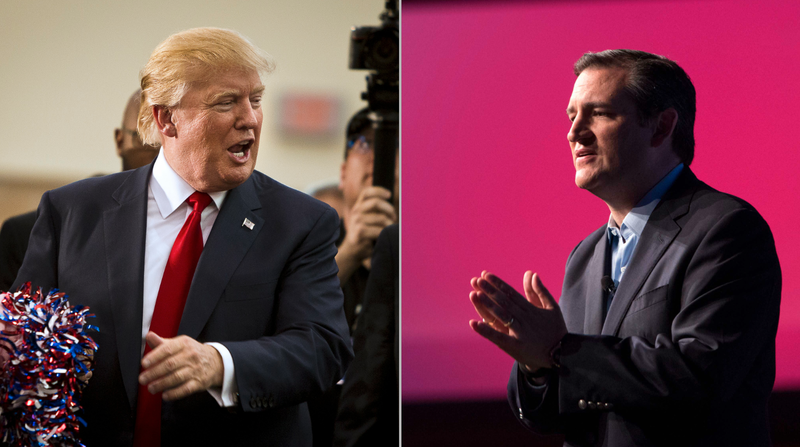 Trump's support remains stable, but Cruz's influx of converts is more than enough to help take the lead. As most Iowa Republicans say terrorism and security are their number-one criteria for judging a candidate, Trump and Cruz are running even among them. But of the one in five Iowans who say "faith and religious values" matter most -- above even handling terrorism and the economy -- Cruz is crushing Trump by more than five to one, and that's the difference in the race along issue lines. Much of Trump's stability in Iowa comes from having committed supporters: forty-four percent of them say they've decided and won't change their minds. Trump has also kept almost all the supporters he had from last month, among those re-interviewed. Ted Cruz's supporters are a little less firmly decided, and more say they "probably won't change," as opposed to being decided. And there is still a lot of potential for movement overall in Iowa, as only 31 percent of voters are "firmly" decided, a contrast from those supporting Trump, in particular. Earlier this fall, Carson had pulled into a tie for the lead with Trump, but has since faded. Former Carson backers re-interviewed this month reported moving more to Cruz than Trump; of the Iowans re-contacted who had supported Carson in November and left him, nearly half -- 47 percent -- went to Cruz and 37 percent to Trump. Donald Trump keeps a big lead in New Hampshire, where he continues to draw support across the board from conservatives and moderates, from Republicans and the independents who can participate in that primary. He's still up about two-to-one over his nearest competitor. And also in New Hampshire as in Iowa, his supporters call themselves firmly decided, with a plurality of 47 percent saying so, well above the overall number of 32 percent across all voters. Marco Rubio holds steady in Iowa, at 12 percent and was up from 11 percent last month. Rubio does not draw the levels of support among either the very conservative or evangelicals that Cruz does, but he has moved a few voters from Carson as well, suggesting that he may be fighting with Cruz for the non-Trump portion of voters. In New Hampshire Rubio is part of a crowded field jockeying for second place, and that battle for second has a new contender in New Jersey Gov. Chris Christie. Christie has more than doubled his own support from just 5 percent last month to 11 percent now, putting him into the mix. Christie appears to have taken a bit of that support from Florida's Jeb Bush and Ohio's John Kasich, and he's polling about as well among conservatives as moderates. On candidate qualities: Marco Rubio's support appears to be helped by those saying he is electable, as nine in ten of his supporters feel he is. Meanwhile, 76 percent of Donald Trump's new Hampshire supporters describe him as "effective" and a similar percent feel he is "electable." Chris Christie elicits a similar percent of his supporters who describe him as effective. Donald Trump stirred controversy lately with calls for a ban on Muslims entering the country, but as these surveys show - along with other state and national polls released elsewhere - that controversy hasn't hurt his standing and the plan general finds favor among Republican primary voters. Republicans favor the idea of banning Muslims - 77 percent in Iowa -- including evangelical voters who also favor it in the same large numbers - 75 percent. More generally, 74 percent of Republican voters also like the idea that Trump "says the things he says." They feel these things "need to be discussed." And voters are talking about Donald Trump - including his. In New Hampshire, a majority of them say they're not just voting for him, they're telling other people they know to vote for him too. Methodology and complete results can be found below and here. The CBS News 2016 Battleground Tracker is a panel study based on interviews conducted on the internet of registered voters in Iowa, New Hampshire, and South Carolina between December 13-17, 2015 with a total of 3,812 interviews. The poll was conducted by YouGov, an online polling organization.